The media LOVES to pit women against each other – from Angelina and Jen to Britney and Christina. You may even deal with it in your daily life, like bosses who only offer a promotion to one particular woman… or people who assume you’re hating on another woman for being successful. Oddly, research doesn’t actually support these ideas of constant conflict. Women are more likely to consider supporting each other as a key part of friendship. Females are more likely to suggest social goals that everyone can participate in or where friends can support and help each other. Interestingly, women of all ages and demographics emphasize loyalty and commitment as an important part of friendship with other women, and rank acceptance highly on the list of qualities important to them. So it’s clear that women support and expect support from the women in their lives. With female friendships, you’ll have someone to cheer on your job promotion, plan activities you all enjoy, and generally commit to being there. That’s what I call #SQUADGOALS. Whether your gal pals live next door or halfway around the world, keeping those bonds strong can make you happier and healthier. So plan a girl’s night or use your phone for its original purpose – to call your soul sister and check on them. Your mind and body will both thank you for your female friendships. Cheers for women supporting women! My girl Nisha and I headed to The Champagnery in Louisville for some much needed lady time last night and had such a great time sipping sparkling rosé and catching up on life. #Twinning never gets old – it just gets more sophisticated with (seriously comfortable) coordinating cocktail dresses from Maggy London that take you from workday to evening plans, and then to the afterparty! 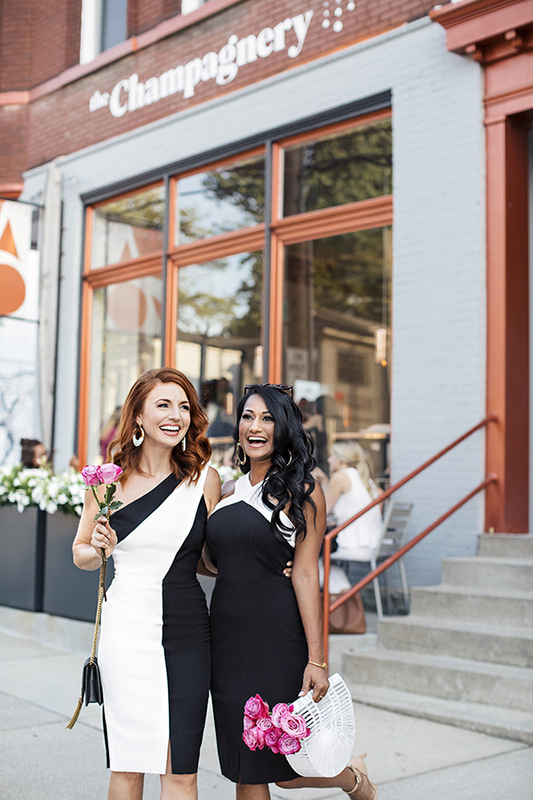 The super chic black + white color scheme makes these otherwise LBD’s (Little Black Dresses!) suitable for every season under the sun. I adore the Maggy London brand because not only are their dresses so wonderfully made and easy to wear, but they cater to ALL shapes and sizes of women… and that is what women supporting women is all about! Special thanks to The Champagnery for an amazing evening!